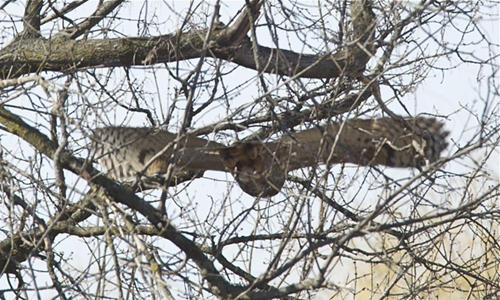 This is a lousy photo of a Great Horned Owl, except that it shows the shape of the wings well. The bird had flushed, and was flying away from me. You can see that the wings are broad all the way to their ends, strikingly so. These wings are built of three different kinds of feathers, all of which contribute to an owl’s silent flight. Silence is necessary because the owl is a night hunter, pouncing on prey unaware of the bird’s presence. The leading edge of the wing has feathers that are serrated, like a comb. This helps with flight stability, and breaks up air turbulence created by the owl’s flight. This can work to reduce the sound of air passing over the wings. Think for a moment of the flight of other bird species. If you listen, you can often hear wing beats, hear the air moving as the bird pumps through it. Common Loon flight is downright noisy. The loon’s long, pointed, stiff wings are built for fast flight. There is nothing stealthy about a loon. The trailing edge of an owl’s wing also has special feathers. They’re almost like fringe, with free-flowing edges that reduce turbulence and, again, muffle the sound of air meeting wing. Owls certainly have wing feathers built for flight. They’re long and stiff. These feathers are kept silent by a covering of downy feathers that absorb much of any remaining sound. The owl’s legs are similarly covered for the same reason. The broad wings allow owls to flap less and glide more. Gliding is silent. Gliding is often the final step in prey capture. The bird gives no warning. The entire silence package also helps the owl hear its prey, which is how the bird locates dinner in the darkness. My photo coincidentally was taken a few days before I received an email directing me to an article written by Marcia Davis for the Knoxville (Tennessee) News Sentinel. Information she provided contributed to this post.